The first stop in our trip to Switzerland was Zurich. Arriving early in the morning we started as we meant to go on, by walking. Walking very long distances! We explored the city on foot and by tram. The weather was glorious and unexpectedly hot. After monitoring weather forecasts closely we had prepared for rain but as with previous short breaks… We got lucky! Zurich was like many other European cities I have visited and to be honest, I wasn’t blown away by it. It was clean, there was a variety of architecture and it even benefits from sitting on a large lake. It was nice but for me, it wasn’t that special nor was it the main attraction for our trip to Switzerland. Zurich’s wealthy inhabitants showed off their high end watches, designer clothes and supercars and as a car lover this was initially very exciting – listening to top marques flexing their power on the streets of Zurich. It did however get somewhat irritating, listening to the cars rev their engines in 1st gear until they reached the next traffic light without fully opening the car’s potential. Show offs. Locks on bridges. This is a real bug-bear of mine. Why? People’s vanity and desire for their 15 minutes of ‘fame’ is truly perplexing. Attaching a lock to a bridge with your initials on it is one of the less offensive but most cringeworthy acts I see occurring at monuments and landmarks across the world. Others include people graffitiing Auschwitz and I have even witnessed someone at Pompei etching their name into a pillar – preserved for thousands of years, to scribe something ‘cathartic’ such as “Never forget” into the artefact. Disgusting. Anyway, what happens when these people inevitably end their relationship with the person they’ve felt so compelled to buy, inscribe and lock a padlock to all these monuments? Do they go back and remove them? Eurghh, Rant over. We ended our day in the city with a boat trip around lake Zurich. The following day we headed south towards Interlaken in the centre of Switzerland. As mentioned in previous posts. I love the mountains and Switzerland certainly isn’t short of mountains nor was it as we were to find out, short of Chinese tourists! We took Switzerland’s famous golden line train through the country via Luzern – another nice but underwhelming Swiss city, home to Europe’s oldest covered bridge which incidentally had the forethought to include signs warning visitors not to graffiti the bridge. We based ourselves just outside of Interlaken in a small town called Wilderswil. This is what I wanted to come to Switzerland for. The images I captured are simply cliche when you think of Switzerland: Rolling green hills, wooden chalets, church spires and mountains (We even heard a local resident listening to yodelling music). Interlaken itself catered predominantly to the huge numbers of Asian tourists who were using it as a base. I did some research into why it was such a popular area for Chinese tourists and from what I found, the prime reason is money… The tourists are wealthy and are keen to buy high end watches and spend their money in the area. Restaurants and bars were even presenting menus in Chinese and convenience stores placed instant noodles at the front of them. This article explains it further. 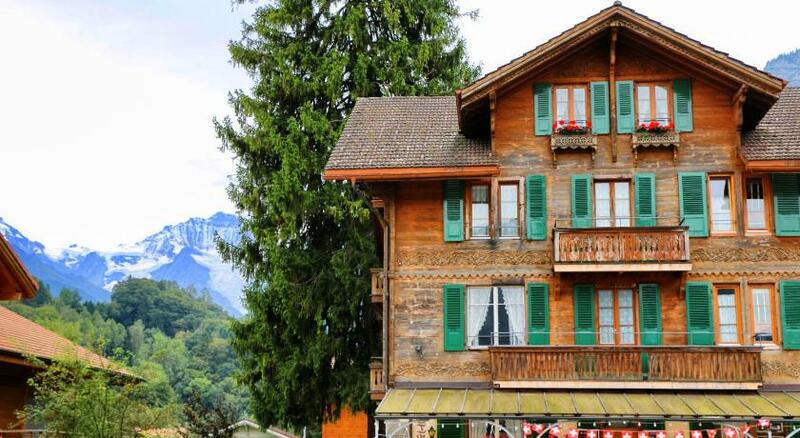 This huge tourism boom was reflected in the prices of food and drink in the area and we found it much better value to eat in our hotel’s restaurant which was wonderful – offering Swiss classics such as fondue, rosti and sausages, without the inflated prices. The following day was Nadine’s birthday and we caught the train to Grindelwald on the edge of the Jungfrau range of the Swiss Alps. This is significant for her as her dad was a mountaineer, Jungfrau is one of his favourite summits. I was pretty snap-happy here. The views were unbelievable and I made good use of my wide angle lens. We took the cable car to the ski region and took in some more incredible views and sunned ourselves on the terrace. Also, you’ve taken very lovely photos!